The new Dior Bronze Monoï Balm soothes skin exposed to the warm sun, moisturizing it while extending the intensity of your tan by up to 1 month after your last sun exposure. 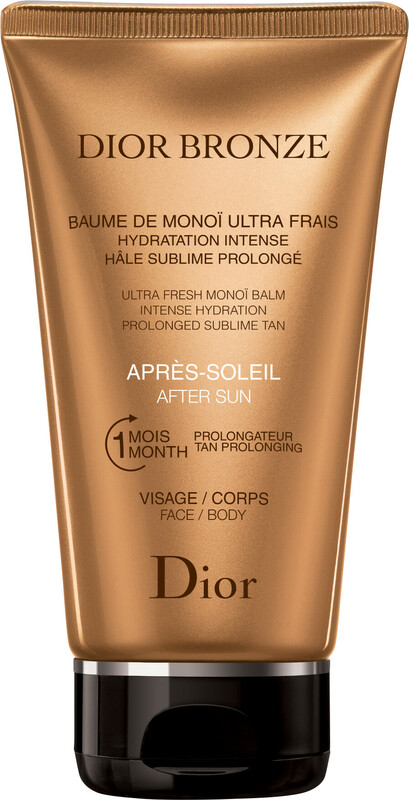 The new Dior Bronze after-sun care refreshes and hydrates skin dried out by the sun. Upon application, your tan is instantly and lastingly embellished and the skin is infused with the delicate scent of Polynesian flowers. Soothing action: the ultra-fresh, lightweight, melt-in texture of the Monoï Balm instantly soothes skin exposed to the warm sun. Moisturizing action: its formula with monoï extracts rehydrates the skin and compensates for dryness caused by sun exposure. The skin is moisturized, refreshed and more supple. Tan-prolonging action: enriched with a tan-prolonging complex, the Dior Bronze Monoï Balm after-sun care helps boost and extend the intensity of your tan by up to one month after your last sun exposure. The skin is adorned with a subtle and luminous pearly finish, benefiting from only the best of the sun to reveal a golden, radiant tan. Apply generously to the face and body after each exposure. To prolong a tan, re-apply after the last sun exposure.